Obviously something got into the water to make it foam like that. I am making progress. 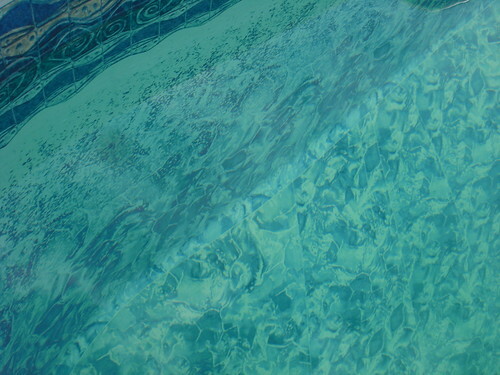 I can see the drains in the deep end and the pool is starting to hold chlorine, but it's still fighting something. I lost 6 ppm in the last hour after the sun went down. We'll see how much is left in the morning. Other than that, everything's GREAT! Any ideas? I need to get stabilizer back into the water, but where should my target be for cya and cl while I'm clearing this up? Did the non-priming pump contribute to any of this? With CYA 0, during the day you're losing nearly all FC to sunlight before it can do any good. You want 20-30ppm asap. After you clear the pool and hold FC overnight, you can bring it back up to normal SWG levels. No clue about the foam but it's probably worthwhile trying to skim it off. What PaulR said, get some CYA in there ASAP. Aiming for a CYA of 30 is a good place to start, then raise it further once the water clears up. Other than that, you are on the right track. 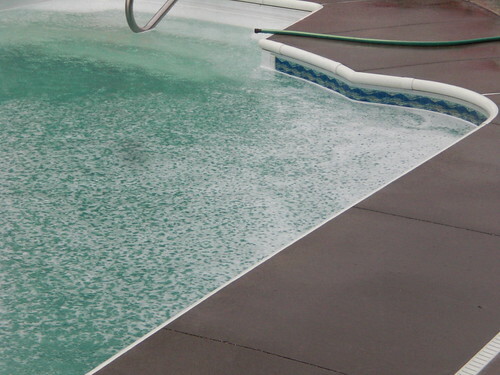 Chlorine will clean up the foam, though it may take a couple of days. the pool lost 9 ppm overnight (about 45% of the FC) the foam is gone and the water is getting pretty clear. CC's are down to .5 and the FC is at 8ppm. I am currently dissolving the first 5 pounds of cya to see where that gets me. I'd like to know what caused the cya to drop to 0. I thought I read in another thread that bacteria in the water can eat up the cya. Is there some other test I should run for bacteria? Is the course of action the same: hold the water at shock level until there's no FC loss overnight? I rubbed a vitamin c tablet on one of the returns and it whitened up nicely. 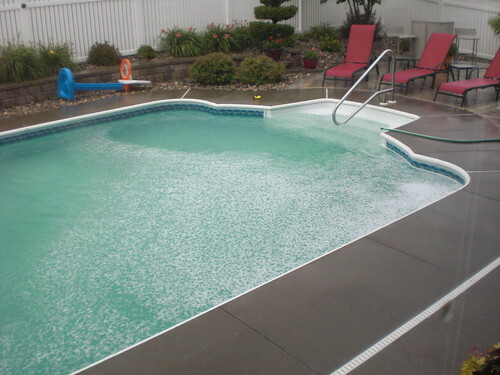 But how do I remove the stains from the entire pool? There is a kind of bacteria that can break down CYA. It can only grow when the FC level is zero, and dies the instant there is any chlorine in the water. You should add a startup dose of sequestrant and lower the PH down to around 7.2 (when the FC level is relatively low) to help with the stains. There is some chance that will clean things up. If the stains still remain when you have things back to normal you can do an AA treatment to remove the stains everywhere.